HABA 2200 - Have a look! The mouse is peeking out from inside the house and the happy frog smiles back. 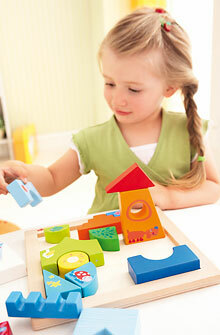 The big handy pieces can be puzzled into endless different arrangements or stacked up into a funny pile. 17 beech wood pieces. Frame measures 8.8" x 8.8". Recommended for 2 - 6 years old.